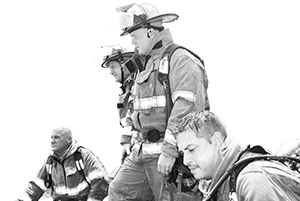 Clayton County Fire & Emergency Services is an all-hazards department that responds not only to Fire & EMS calls, but emergencies such as hazardous materials, technical rescue, natural disaster. CCFES provides these various types of emergency coverage to all of unincorporated Clayton County, as well as the cities of Jonesboro, Riverdale, Lovejoy and College Park. The Department’s service area encompasses approximately 122 square miles and serves a population of over 259,000 residents and is operated under the direction of the Clayton County Board of Commissioners. CCFES maintains fourteen fire stations, an administrative office building and other supporting facilities all strategically located throughout the jurisdiction. It staffs seventeen companies, including structure and wildland engines, ladder trucks, ALS ambulances, and specialized Hazardous Materials, Rescue, Communications and other support units. The Department’s Fire Prevention, EMA/Homeland Security, & Public Affairs Divisions manage several significant community risk reduction initiatives including Ready Clayton, plan review, comprehensive code enforcement and fire investigation activities. The Division also produces and delivers numerous programs intended to promote and teach fire safety, CPR/AED skills and emergency preparedness. Within the boundaries of Clayton County are expansive woodland and recreation areas, large single-family homes and multi-family residential complexes, hotels, a regional hospital and an international airport. The County is also crossed by 3 major interstate highways (I-75, I-675, I-285). HONOR…to serve with respect in a safe and professional manner. COURAGE…to overcome adversity through training, instinct, and compassion for others. COMMITMENT…to provide excellence in every endeavor. 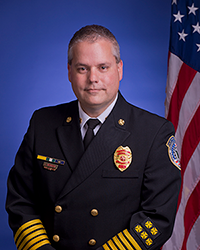 Clayton County Fire & Emergency Services is committed to providing our community with a safe place to live, work and play through cutting edge emergency response and education delivered with compassion and professionalism. It is my sincere and distinct pleasure to present you with the strategic vision for Clayton County Fire & Emergency Services. This strategic plan will carry this organization through the year 2021 and has been seamlessly aligned with the strategic initiatives and pillars of the Clayton County Board of Commissioners. Clayton County Fire & Emergency Services (CCFES) provides the community with fire suppression, emergency medical services, hazardous materials incidents, technical rescue, community risk reduction, fire investigation, public education, and disaster preparedness planning and response to Clayton County, Georgia’s residents, businesses, and visitors. 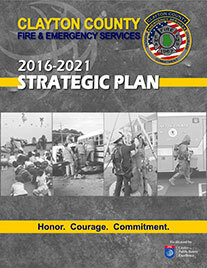 The agency is consistently working to achieve and/or maintain the highest level of professionalism and efficiency on behalf of those it serves, and thus, contracted with the Center for Public Safety Excellence (CPSE) to facilitate a method to document the organization’s path into the future via a “Community-Driven Strategic Plan.” The following strategic plan was written in accordance with the guidelines set forth in the CFAI Fire & Emergency Service Self-Assessment Manual 9th Ed., and is intended to guide the organization within established parameters set forth by the authority having jurisdiction. The CPSE utilized the community-driven strategic planning process to go beyond just the development of a document. It challenged the agency’s members to critically examine paradigms, values, philosophies, beliefs and desires, and challenged individuals to work in the best interest of the “team.” It further provided the agency with an opportunity to participate in the development of their organization’s long-term direction and focus. Members of the organization’s external and internal stakeholders’ groups demonstrated commitment to this important project and remain committed to the document’s completion. This strategic plan, with its foundation based in community and membership input, revisits the organization’s pillars (Mission, Values, and Vision) and sets forth a continuous improvement plan that offers a road map for a justifiable and sustainable future.